We certainly have the lion’s share of Italian restaurants in northern New Jersey. It’s almost impossible to decide where to eat, with so many to choose from. First-world problem, I know. But it really is hard to make a choice, especially since we have some favorites that we always enjoy returning to. My boyfriend’s birthday fell on a Monday this year, so our usual go-to restaurant for all special occasions was closed. 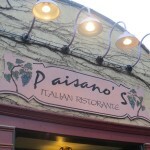 We started reading some reviews, and eventually decided on Paisano’s in Rutherford, NJ. I used to work rather close to Rutherford some years back, so I’d been to Paisano’s a few times. It was always a decent meal, and I had no qualms about returning. Little did I know that over the years, many things had changed. We had a wonderful experience, and decided to go again a couple of weeks later – this time, with my parents. And my camera. My parents have been influential in molding the way I go out to eat. My step-father Earl, especially, increased my love of fine dining and lingering over a meal. They both taught me that going to a restaurant was about more than just the food. Because of this, whenever we find a new place, I’m always excited to bring them there. 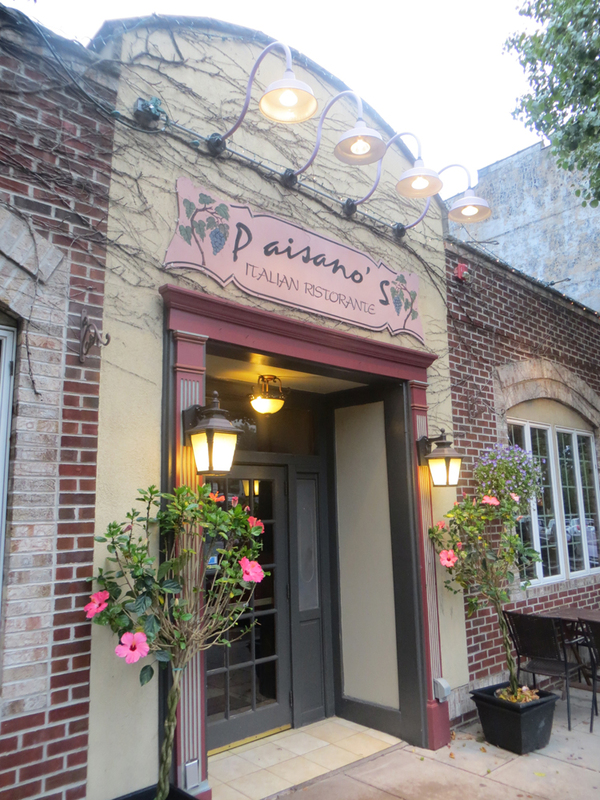 Paisano’s is on a quaint Rutherford street, lined with cute shops and many other restaurants. It’s a nice street to stroll on, but because of the large amount of businesses there, parking is usually hard to find. We parked on the street behind the restaurant and walked over. Please note, street parking is metered until 6 or 7, so have some quarters with you if arrive early. We had a 7:00 reservation on a Friday night. New Jersey traffic didn’t disappoint, and my parents were late – but there was no problem. We were ushered to our table as soon as they arrived. My mom, who worked at the same company as I did years back, had also been to Paisano’s in the past. Her mouth was agape as we walked through. What used to be a one-room, store front kind of place with standard, bland décor, was now a huge, elegant, beautifully appointed restaurant, with at least 3 separate, inviting dining areas. Our server approached once we were settled on our padded leather dining chairs. Her name was Pat, and she was the epitome of a professional server. She knew the menu and specials backwards and forwards, and described everything we asked about with authority – you believed she’d tasted everything she spoke about. Mom loved the way she talked (saying “mootsadell” instead of “motzerella”, for example – the way we’ve always said it – real NY/NJ Italian style). We commented on the change in the appearance of the restaurant, and Pat let us know she’s been working there for something like 27 years. She’d seen it all. She’s a woman who loves her job, who’s proud of where she works and what she does, and it shows! Paisano’s, like many northern New Jersey restaurants, is a BYO place. This cuts down on the bill tremendously… and we get to bring wine we know we love. Win/win! We brought two bottles. One was a cabernet sauvignon, but I don’t recall which one it was. The other was a Sella & Mosca Cannonau Di Sardegna Riserva 2007. The Sardegna is a heavy Italian wine. It reminds me of a cab. I love it, for those reasons. My parents brought an Amarone della Valpolicella. I’m not sure of the year, but this is their stand-by Italian wine, and they bring it whenever we go out for Italian food together. It’s delicious. Pat had our bottles opened for us, and I mentioned just ordering appetizers at first. She said she had to take our entire order at the same time. That worried me. And that was not the case on our previous visit (though we had a different server). She assured me that our meal would not be rushed, despite placing our entire order at once. Not wanting to cause a argue the point, I agreed, and we all continued to study the menu. A basket of nice hot rolls, cut in half, and butter came out first. 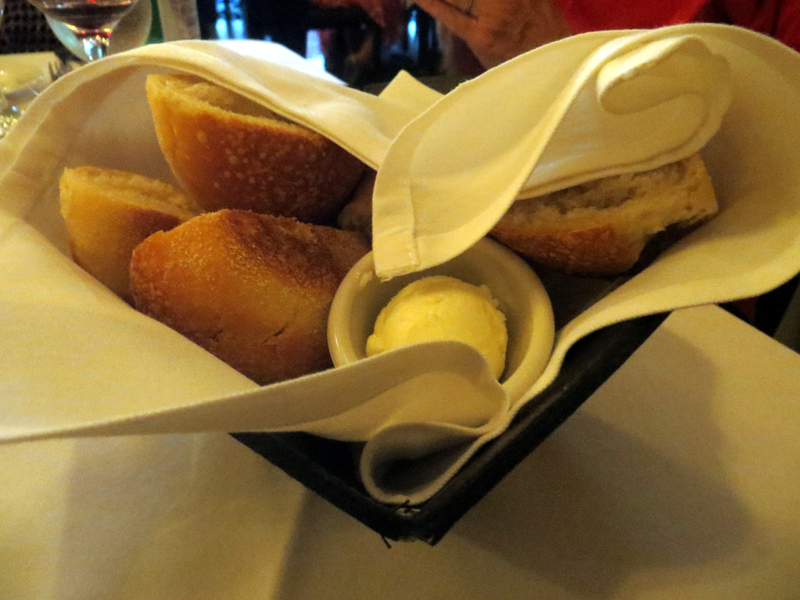 They were flaky outside, soft inside – the way bread should be. 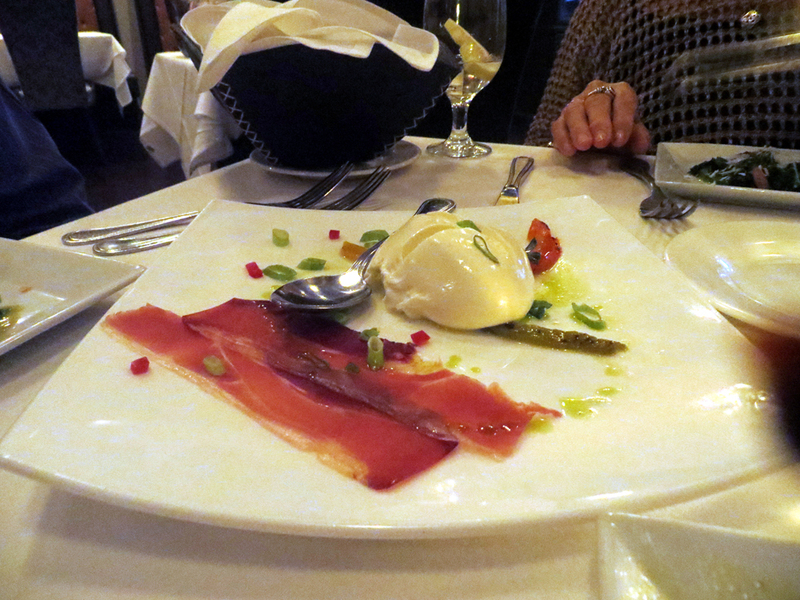 For our appetizers, we chose one of the specials, which was fresh mozzarella with prosciutto. “Fresh” was an understatement. This mozzarella was still warm, and so creamy that it was almost more like ricotta. Fantastic. And the prosciutto had barely any fat. Perfect flavor, sliced thin. 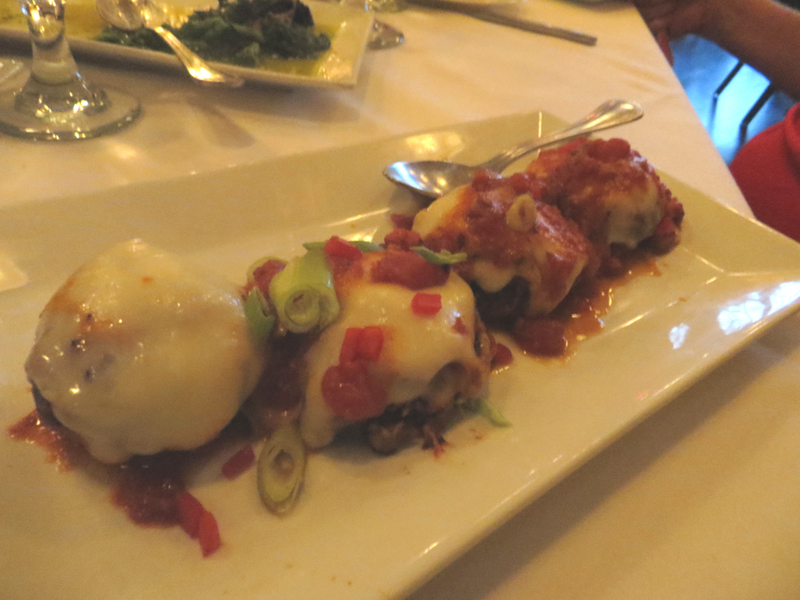 Our second appetizer choice was the mushrooms stuffed with sweet Italian sausage. The sausage was actually quite spicy, which is more to our liking, so they were even better than we expected them to be. We also ordered a dish of broccoli rabe. You can kind of see some of it in the background of the mushroom picture, but it was gone so fast that I didn’t get a good shot of it. My mom said it was the best broccoli rabe she’s ever had. We all enjoyed it. As we usually do in Italian restaurants, we ordered a pasta course for the whole table to share. 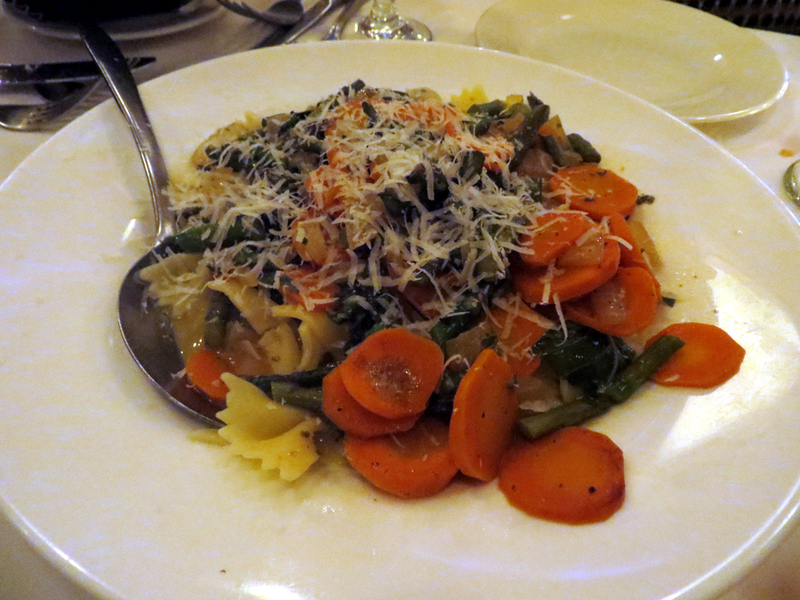 Our first choice was Spring Butterflies – which is bow-tie pasta sautéed with onions, carrots and asparagus. We’d ordered this on our previous visit, and it was tasty enough to order again. Light, flavorful, slightly acidic sauce with al dente bow ties and fresh veggies. Simple, but delicious. Mom, who doesn’t usually eat pasta, picked out the vegetables and ate those. She said she’d order that dish without the pasta, if they’d allow it. The sauce and veggies are that good. Dan picked our second pasta – Pear Ravioli. 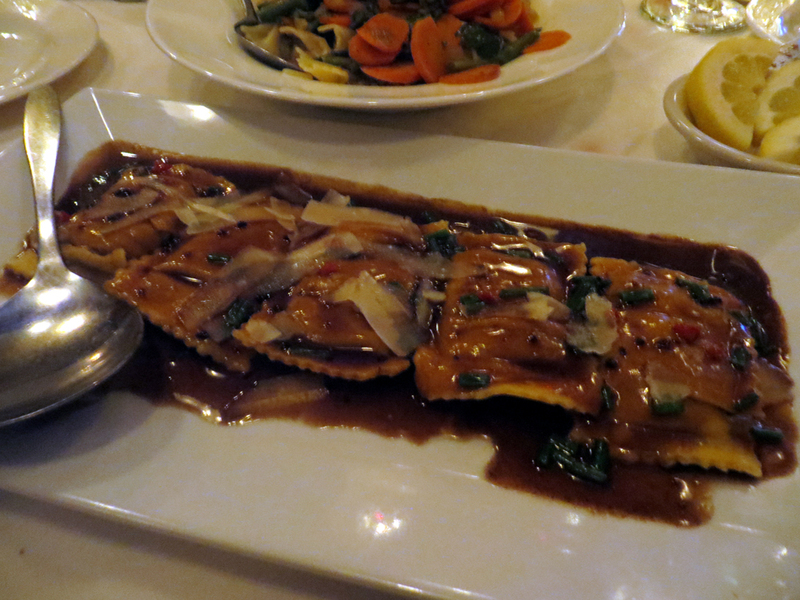 These were 5 large homemade ravioli, stuffed with pears, walnuts, and goat cheese, and covered with a sweet balsamic glaze. Ohhhhh my. These were ridiculously good. I could almost eat them as a dessert. I don’t see them on the current menu, which is bringing me close to tears 😉 Their menu seems to change frequently, like most good restaurants, so hopefully these ravioli will return in the future. We almost always order all different entrees, but this time, Dan and Earl ordered the same thing. 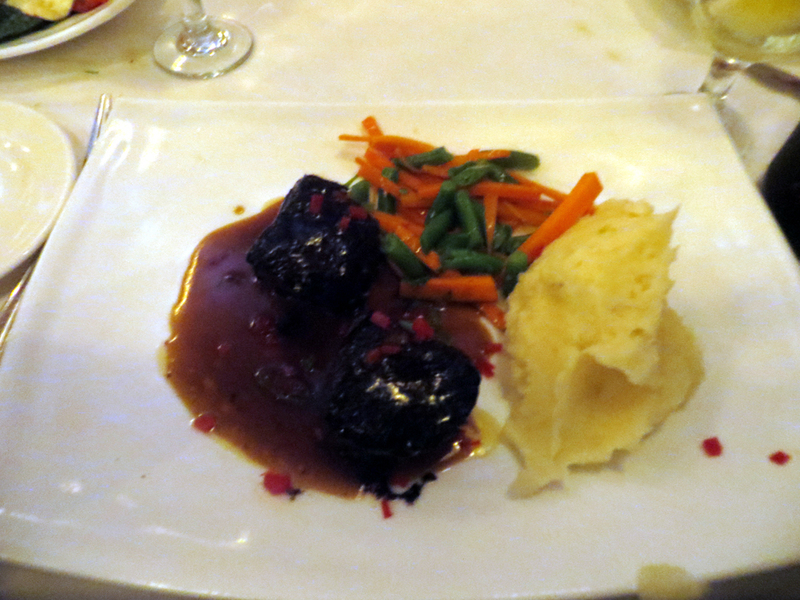 It was a special – Short Ribs covered in a glaze that contained, among other things, red chilis, coffee, brown sugar, served with mashed potatoes, carrots and green beans. I don’t have words for how good this was. I had serious plate-envy. The short ribs melted in your mouth. The spicy/sweet combo was out of this world. Dan and Earl definitely won ‘best entrée choice of the night’. Mom had a variation on Chicken Paisano, which is breast of chicken sautéed with fresh tomatoes and wine, topped with ham and cheese. She got hers without the ham, and with spinach and mashed potatoes instead of pasta. She enjoyed this meal very much, noting that it was a relatively light entrée. 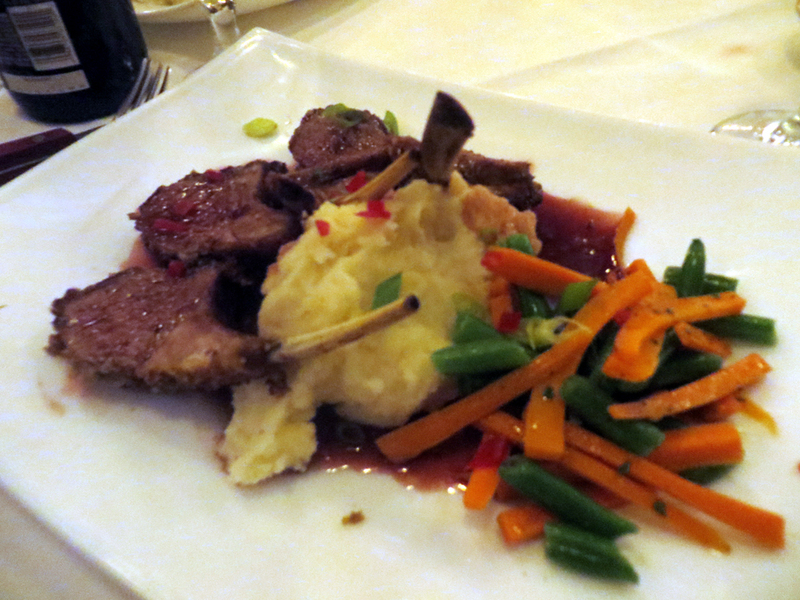 I chose the lamb chops, which were also served with mashed potatoes, carrots, and green beans. To be honest, the chops were cooked a little bit more than I wanted them to be, but the flavor was great. And the mashed potatoes were fabulous. I am a connoisseur of mashed potatoes. They would be my ‘you can only have one food for the rest of your life’ choice. These were just like homemade. Fluffy, buttery, delicious. I loved them. Finally, it was time for dessert. We all got cappuccino or espresso, too. 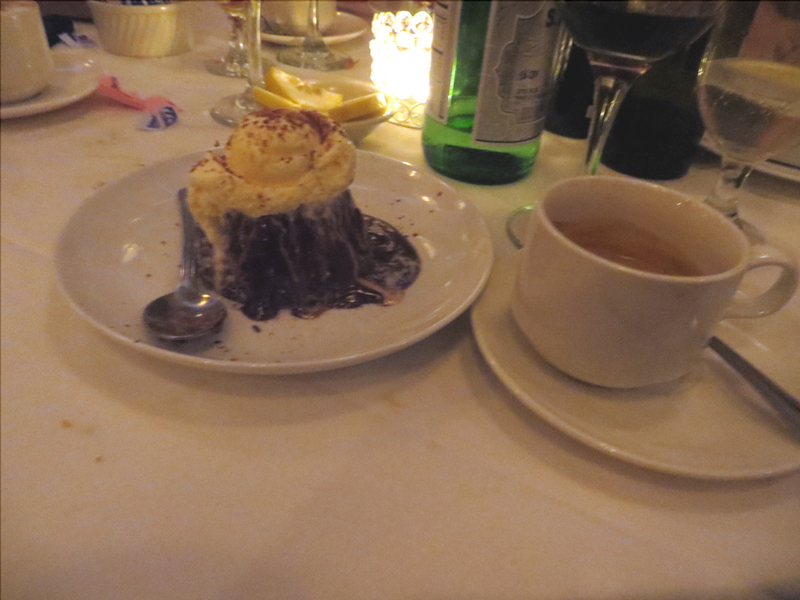 Dan chose the Chocolate Lava cake. It’s hard to go wrong with that one. Earl had an Apple Tart with ice cream. Another standard choice. The picture of this came out way too blurry, unfortunately, but it was a cute presentation, served in a small round tart dish. 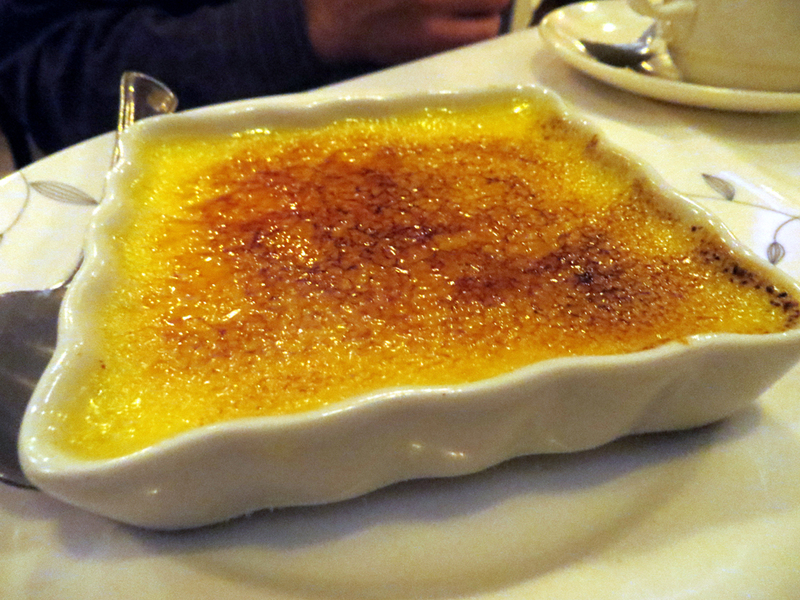 I chose the crème brulee. All 3 desserts were great. Nothing out-of-the-box, but just classic desserts, prepared perfectly. This was an incredible meal. We were all raving all night long. And I was right to trust Pat to time our meal. We enjoyed each course in a leisurely manner, we had plenty of time in between courses, but were never waiting anxiously for our next choices to arrive. She paced everything exactly right. I believe our bill came to about $250, which is extremely reasonable, considering the amount and quality of food we had. 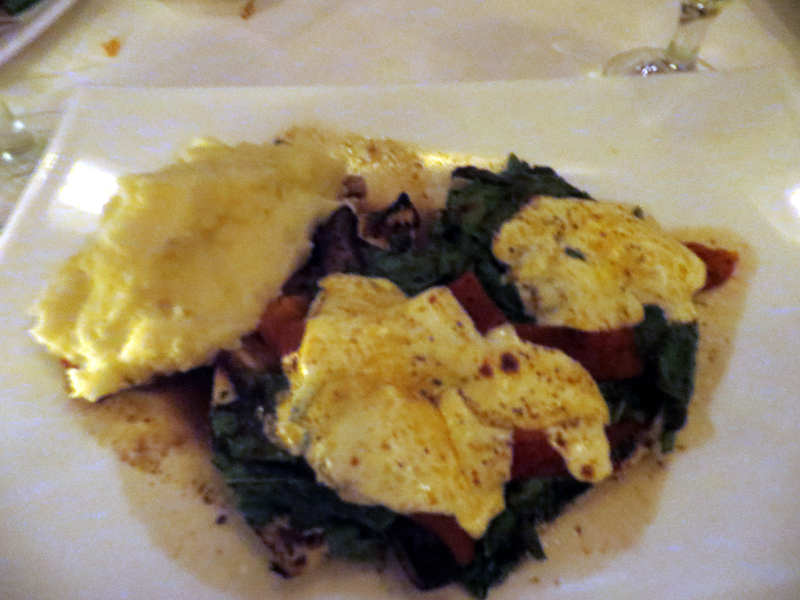 Paired with expert service and warm, lovely, upscale atmosphere, it made for a wonderful night. 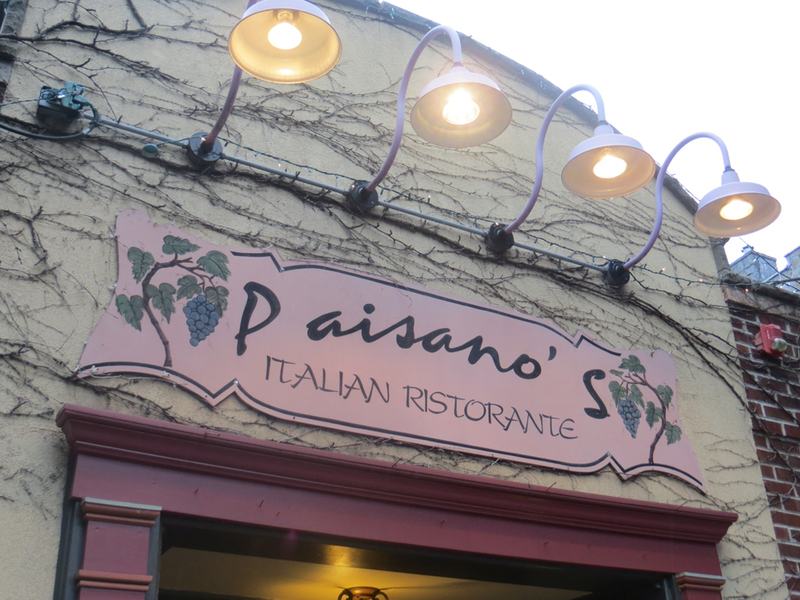 Paisano’s had quickly moved into our list of favorite restaurants, and we look forward to returning. This entry was posted in Eat Like a Local, Foodie Tales and tagged bow-tie pasta, cappuccino, Chicken Paisano, Chocolate Lava cake, creme brulee, espresso, fresh mozzarella with prosciutto, Italian, Italian Food, lamb chops, mushrooms stuffed with sweet Italian sausage, New Jersey, Paisano's, Paisano's Rutherford New Jersey, Pear Ravioli, Rutherford, Rutherford New Jersey, Short Ribs by Gillian Smith. Bookmark the permalink.